If getting a call from the school nurse can be unnerving, hearing that your child just had an asthma attack at school is downright terrifying. This especially holds true if the call marks the first time an asthma attack has ever happened. The only thing worse for parents than knowing that their child is suffering is knowing that their child is suffering when they can’t be there with him. Since parents cannot be with their asthmatic child 24 hours out of the day, ensuring the child and teachers know how to manage his asthma is the next best thing. If you’ve been told your child has had an asthma attack in school, hang in there as you learn about what to do next. The first thing you’ll want to do is find out the status of your child. If it is not under control, the school may have called 911 or may ask you to pick up your child seek medical attention. The emergency room should be your first stop if the attack is still in progress, but an attack that’s under control or has ended may only require a trip to his regular primary care physician. Once the initial attack is under control, let your pediatrician know what happened and then make an appointment to create an action plan for your child’s asthma. On this action plan, write down what triggers your child’s asthma, what symptoms he exhibits when he begins to have a flare up, what medications he takes, along with the dosage, what to do when an asthma attack begins, and when to head to the emergency room. You also may want to ask the doctor if there should be any restrictions or any extra monitoring during exercise. Teaching your child to manage his asthma independently is the best thing you can do when he’s old enough to attend school. Both you and your child need the security of knowing that no matter where your child is or who he is with, he can handle his asthma. Therefore, share the action plan with your child and frequently go over the steps to managing his asthma and handling attacks. Share your written action plan with your child’s school and request a meeting with his teacher, the school nurse and anyone else you feel should be involved. 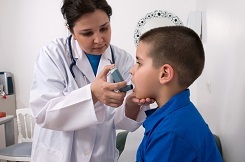 Explain your child’s medical history and how independent he is in handling his asthma. Make sure you cover not only how to handle his asthma in school, but also on field trips and during any after school activities. Ask questions to ensure that there is always someone present who can administer medication and work the peak flow meter. It’s important that the school is supportive of your child’s condition, and that they handle it in a way that will not embarrass your child and deter him from maintaining his care. Also, find out if you child is allowed to carry his own medication, provided that you feel confident in his responsibility level. If the school does not allow it, you can request a 504 plan under the Americans with Disabilities Act that allows him to have the medication on him. Your child’s medication should be easily accessible. If he is too young or not yet responsible enough to carry it himself, the medication should be close at hand to the classroom teacher and in the nurse’s office in a place that is within quick reach. It should also be close at hand for gym class and recess. This way if your child has an attack, the medication will be there to be used immediately no matter where he is. There are some common triggers that children encounter in school, such as dust mites, cockroaches, chalk dust, perfume and cleaning products, just to name a few. If any of these are known culprits for your child, you should work that into their 504 Plan. For example, you can request that they use dustless chalk, avoid perfumes and certain cleaning products, that the school is treated for pests regularly, and that methods be employed that combat mold. If the classroom has a pet, you can ask for that to be removed as well if your child is allergic or triggered by dander. Once you have gone through all of these steps, you can rest much easier knowing that you and your child have a good handle on his asthma and that you have taken control of the situation as much as possible. Creating action plans and taking preventative actions can change a situation that once caused vulnerability to one that empowers.